SMS Kenseiden (USA/Europe) in 07:01.0 by AngerFist. Kenseiden follows the story of Hayato, a samurai looking to retrieve five ability-granting scrolls and kill some evil warlocks. 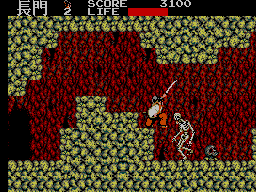 Normally this involves battling through sixteen levels, the last several of which are very difficult without the abilities gained from the scrolls. Here AngerFist foregoes all but two of the scrolls and heads directly for the final round.